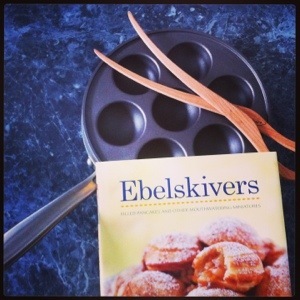 Say it with me: Ebelskivers (“able-skeevers”). 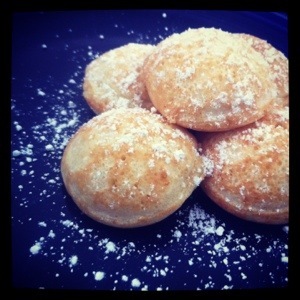 Essentially bite-sized pancakes, Ebelskivers can be made either plain or filled with sweet or savory ingredients. 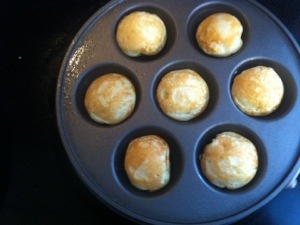 A traditional Danish snack or dessert, Ebelskivers are often served for Christmas and social gatherings. My cookbook Ebelskivers: Filled Pancakes and Other Mouthwatering Miniatures, by Kevin Crafts, even includes the legend of their origin. One version of the legend says that Vikings first invented Ebelskivers by using their damaged shields to cook pancakes in the indentations after returning from battle! Ebelskivers have a consistency very similar to pancakes, yet they are lighter and more airy; think a popover but not as chewy. My husband has compared them to donuts, and they are the size of donut holes, yet they are not heavy like cake donuts, or as light as say a glazed donut hole. Ebelskivers are their own unique little treat you must try. 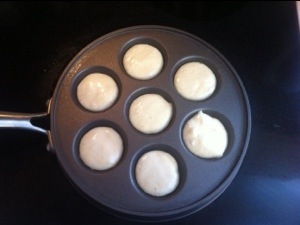 I first learned about Ebelskivers a few years ago when we were creating our wedding registry. We saw the pan and recipe book at Williams Sonoma and thought it would be something different and fun to add to our registry. We both like breakfast, and we ocassionally make breakfast foods for dinner. Ebelskivers are not difficult to make, however they do require a few extra ingredients and steps beyond a basic homemade pancake batter. 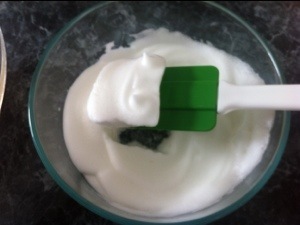 You will also need the traditional pan and wooden skewers or thin icing spatulas to flip them duirng the cooking process. 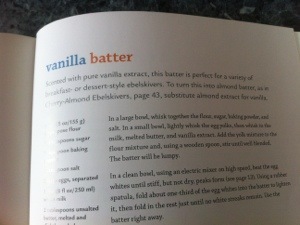 While you can buy batter mix at Williams Sonoma, I like the over forty options my cookbook gives me. 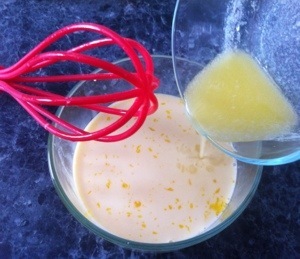 My favorite basic recipe to use though is the “vanilla batter” recipe, which calls for the ingredients listed above in the “basic batter” recipe as well as 1/2 teaspoon of vanilla extract. Simple enough, right? With the blizzard this weekend I was craving some comfort food (don’t we all during snowstorms?). At first I was contemplating making pancakes for breakfast this morning, but I didn’t want anything that heavy before heading out to shovel my way out of our front door. 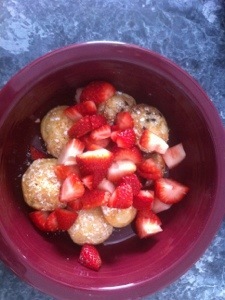 And then I remembered – Ebelskivers! 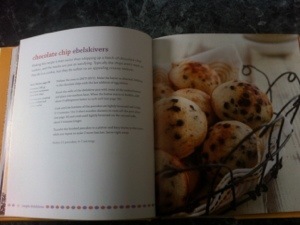 I flipped through my cookbook to figure out which flavors to make. 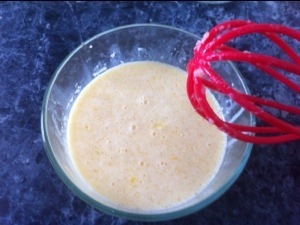 I always like to make the “vanilla batter” because it is very versatile and goes well with fresh fruit, and a second recipe to try something new. 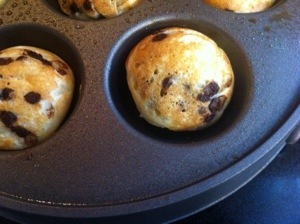 I decided on “chocolate chip” Ebelskiver today, yummmm! 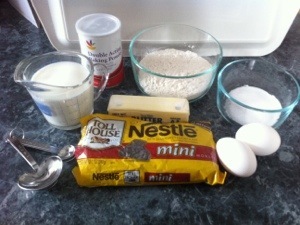 The “chocolate chip” recipe is the “basic batter” with 6 ounces of miniature semisweet chocolate chips added to the batter. 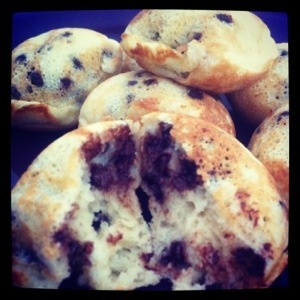 However, I decided to just make one batch of the “vanilla batter” and add chocolate chips to the batter after I’d used half of it since each batch makes about 21 Ebelskivers or 4 servings. 1. 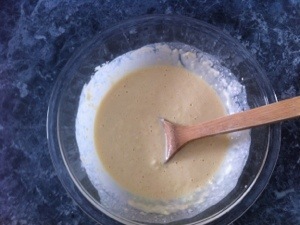 Preheat your oven to about 200 degrees this way you can transfer the finished pancakes onto a foil covered cookie sheet or an oven-safe platter to stay warm while you make the whole batch. 2. I like to pull out all the ingredients I will need so everything is ready to go. 3. 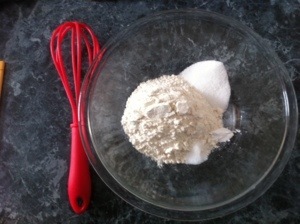 In a large bowl, whisk together the flour, sugar, baking power, and salt. 4. 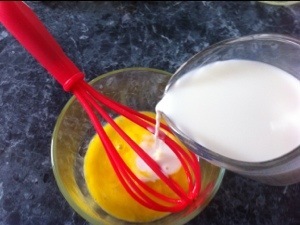 In a small bowl, lightly whisk together the egg yolks, then whisk in the milk and melted butter. 5. 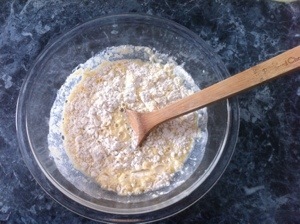 Add the yolk mixture to the flour mixture and stir until well blended using a wooden spoon. 6. 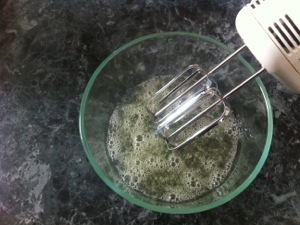 In a clean bowl, using an electric mixer on high speed, beat the egg whites until stiff peaks form (but not dry peaks). 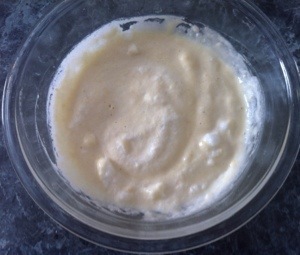 The egg whites are beginning to stiffen. 8. 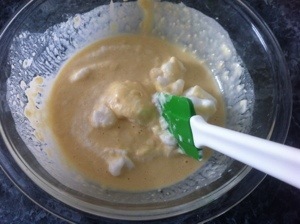 Using a silicone spatula, fold about 1/3 of the egg whites into the batter to lighten it. 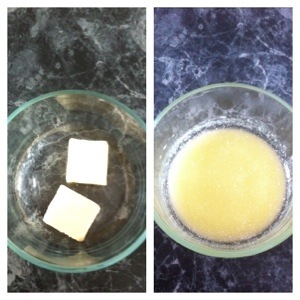 Repeat with the rest of the egg whites until you can no longer see white streaks in the batter. 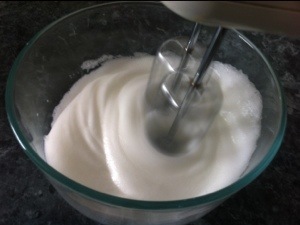 TIP: When folding in the egg whites, a good trick is to use the spatula to “slice” through the batter like a butter knife and then rotate the spatula up and over with your wrist to fold the egg whites in. 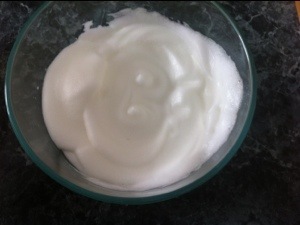 I rotate the bowl a quarter turn for ease after each fold, and it prevents me from overmixing. 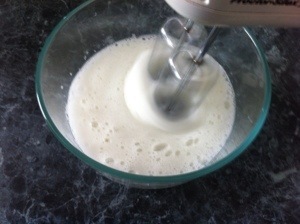 Remember to gently fold the egg whites into the batter to keep the batter light and airy, don’t mix them. 8. 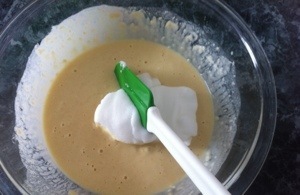 I like to use a 2 inch cookie dough scoop (or you can use an ice cream scoop or a regular spoon) to scoop the batter into to the wells of the pan. 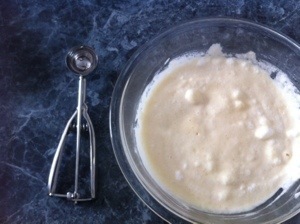 When you add the batter to the wells it’s best to work quickly because they will cook quickly. 10. 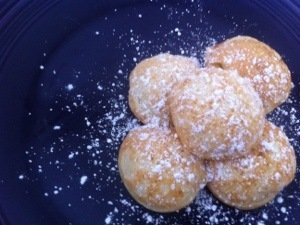 Once bubbles rise in the center of the Ebelskiver, they are ready to be flipped. 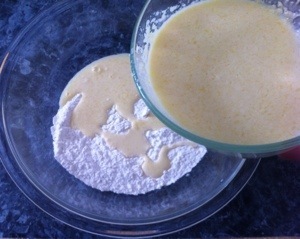 Flipping them takes a little practice, especially since the batter on the top will still be a little runny. 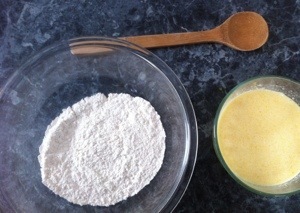 It helps to position the two skewers on opposite sides of the Ebelskiver. 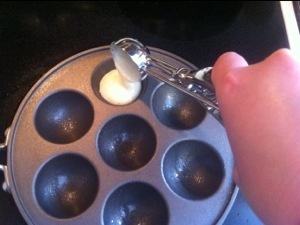 Slide the tips of the skewers between the edge of the Ebelskiver and the sides of the well. 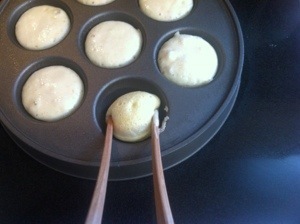 Push down gently with one skewer and use the other to help pull the Ebelskiver up and over. If you aren’t sure if the Ebelskiver is done cooking after you have flipped them and let them cook for 2-3 minutes, I like to flip them back again to check if they are the golden color I’m looking for. I must confess I didn’t measure the chocolate chips today, I added small handfulls at a time, folded them in, and eyeballed it. 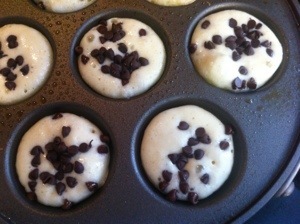 You can also sprinkle the chocolate chips on the top of the batter in the pan. Golden and beautiful. Let’s eat! I like to put fresh fruit over mine (and sometimes a little whip cream! ).